Session of the Heads of the state – founders of the International Fund for Saving of Aral Sea with the participation of the President of the Republic of Kazakhstan, the President of the Republic of Tajikistan, the President of the Republic of Turkmenistan, the President of the Republic of Uzbekistan and the President of the Kyrgyz Republic who was invited by the President of Turkmenistan was held in Turkmenbashy on August 24, 2018. The heads of the states discussed wide range of subjects of cooperation for further improvement of water management, ecological, social and economic situation in the Aral basin as well as noted significant contribution of the International Fund for Saving of Aral Sea (IFAS) in this sphere for 25 years. The sides confirmed their commitment to the decisions taken earlier on joint and integrated management and rational use of water resources and environment protection in Aral Sea basin taking into account the interests of countries of the region on the principles of good neighbourliness and respect. The Presidents highlighted the necessity of further development and improvement of equal and beneficial cooperation in use and protection of interstate watercourses in the spirit of centuries-old friendship of the nations, which have deep historical roots, similarity of culture, customs and traditions. The heads of the states welcomed the adoption of the UN General Assembly Resolution on Cooperation between the United Nation and the International Fund for Saving of Aral Sea from April 12, 2018 and the UN General Assembly Resolution on Strengthening regional and international cooperation for peace, stability and sustainable development in the Central Asian region from June 18, 2018 as well as the UN General Assembly Resolution on International Decade for Action on Water for Sustainable Development, 2018-2028 from December 21, 2016. The Presidents noted the importance of the agreements achieved under the session of the IFAS Board in Ashgabat on January 30, 2018. The heads of the states highlighted the significance of the development of the Aral Sea Basin Programme (ASBP 4) for consolidation of efforts and potential of the states of the regions and international community to solve common priority water management, ecological, social and economic issues of the Aral Basin. The sides highlighted the similarity of the approaches to the solution of key subjects of the Aral Sea agenda including the development of the Aral Sea Basin Programme, which was reflected in adopted Concept for development of such programme. The heads of the states expressed the concern on aggravation of the Aral crisis and its negative impacts, growing number and intensity of natural disasters, accelerated melting of glaciers caused by global climate change and urge the UN Institutions, international and regional organizations to cooperation for solution of these problems. The sides accepted the importance of consolidation of efforts for integrated solution of the problems related to the improvement of social, economic and ecological situation in the Aral Sea basin, especially in the zones affected by ecological crisis. The sides emphasized the necessity of the adoption of coordinated measures aimed at reduction of water and air pollution, lands degradation, expansion of green zones, reduction of risk of natural disasters including floods, mud streams, droughts as well as the provision of pure drinking water and other. 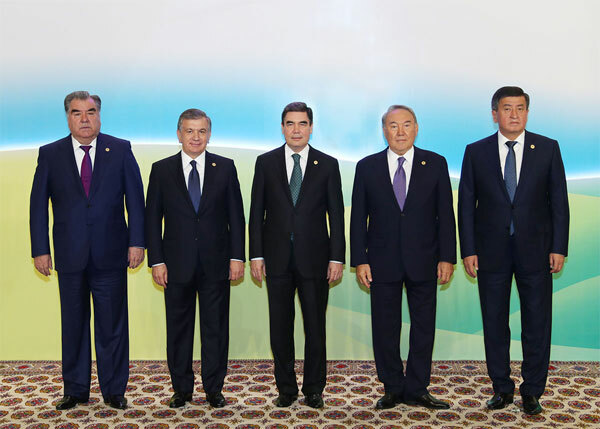 The heads of the states noted the importance of the outcomes of the Dushanbe High-level Conference on International Decade for Action on Water for Sustainable Development, 2018-2028 and Central Asian Ecological Forum and the Tashkent International Conference “Joint Activities for Mitigation of the Consequences of the Aral Catastrophe: New Approaches, Innovative Solutions and Investments” for consolidation and intensification of cooperation between the countries in the region for sustainable development goals. The Presidents welcomed the development of the Regional Natural Protection Programme for Sustainable Development of Central Asia aimed at the realization of the Sustainable Development Goals and environment protection conventions of the UN, development of the principles of green economy and adaptation to the climate change. The heads of the states mentioned the necessity to review the opportunity to develop the UN Special Programme for the Aral Sea Basin and requested the IFAS Executive Committee to consult on this subject with the states of the region, the UN members and the UN structures. The Presidents discussed the opportunity of the countries in the region to join the Framework Convention of Environment Protection for Sustainable Development in Central Asia from November 22, 2006. Taking into consideration the interests of the Parties in integrated and rational use of water and energy resources in Central Asia, the heads of the states noted the importance of hydropower facilities in transboundary watercourses according to international principles and standards for support of social and economic development of the Aral Sea basin. The sides noted the importance of the agreement of the heads of water management organizations of the state - founders of the IFAS on joint works to find the sponsors for the provision of automatic operation of water posts along entire stream of Syrdarya River. Kazakhstan suggested to elaborate the opportunity of creation of stable regional mechanism for integrated use of water and energy resources of Central Asia. The Presidents expressed the willingness to further improvement of organizational structure of legal framework of IFAS for creation of efficient and stable institutional mechanism, which would be able to respond promptly to new challenges as well as to provide beneficial cooperation in realization of regional projects and programmes aimed at the saving of Aral Sea, ecological improvement of the Aral basin and region and in integrated use and protection of water resources, transboundary watercourses, water management, energy and social and economic development. The heads of the states noted the importance of regional youth movement for protection of water resources and environment for provision of the participation of the growing generation in solution of modern challenges and threats. For improvement of personnel and scientific potential of the region, Uzbekistan suggested organizing joint training and improvement of qualification of personnel in water resource and environmental protection spheres as well as joint interdisciplinary studies on the base of the Tashkent Institute of irrigation engineers and agricultural mechanization in cooperation with leading educational institutes of the region. The sides requested the IFAS Board to develop the Action Plan for practical realization of achieved agreements and to provide the control of its fulfilment. Considering the IFAS as universal platform for cooperation of the countries of the region for solution of entire complex of the issues of regional importance including by realization of regional projects and programmes aimed at ecological improvement of social and economic situation in the Aral basin, the heads of the states expressed the willingness to further development of cooperation in this direction. The sides expressed the gratitude to Turkmenistan for high level of organisation of the session of the Council of the Heads of State – founders of the International Fund for Saving of Aral Sea and warm welcome.